This battery-powered trimmer bundle comes standard with battery and charger, and combines great power and lightweight portability. Part of the STIHL Lightning Battery System™ line of products, the FSA 56 delivers STIHL performance and exceptional value. It features an adjustable shaft to fit different user heights for enhanced comfort. Its AutoCut® head feeds out new line with just a tap on the ground. And you can trim the length of five football fields on a single charge – that’s up to 0.31 miles. 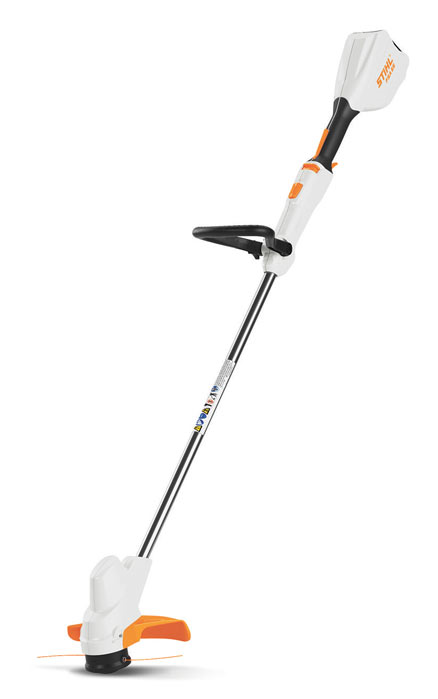 This STIHL AK Series battery trimmer is also just 7.3 lbs. (including battery) for easy portability and maneuverability. And when you’re done, hang it on the wall from its onboard hanging slot. The FSA 56 bundle comes standard with the AK 10 battery and AL 101 battery charger. The FSA 56 is also available as a stand-alone unit without battery and charger. Protected Spark Arrestor Muffler has large baffles which reduce noise level and contains a screen designed to reduce the emission of sparks. Protected Spark Plug is protected yet easy to change. Air Filter Cover is easy to remove for fast and easy filter cleaning or replacement. Upright Translucent Fuel Tank allows operator to easily check fuel level before starting work. Upright position makes it easier to refill. Smooth Clean Design has no rough edges to snag on clothing or brush. High-Tech Polymer Housings are lightweight, withstand greater impact and are corrosion-resistant. Purge Pump Primer lets you prime the carburetor without flooding it. Protected Choke Lever/Knob helps prevent damage. Heavy-Duty Centrifugal Clutch is designed to reduce slippage. Throttle Trigger Interlock must be depressed before the trigger can be activated. Fully Lined Drive Shaft provides smooth operation and less vibration. Adjustable Front Handle adjusts for comfort. Protected or Enclosed Control Cables eliminate dangling and loose wires. Protected Throttle Trigger helps prevent damage. Professional models only. Clip for Strap or Harness. Long-Life Cylinders provide maximum wear life, better cooling and lubrication, more power output. Electronic Ignition provides easier starting and smoother running. Superior Balance and Design help reduce operator fatigue and make handling easy. Family Engine Concept includes many interchangeable components across model lines, enabling fast field fixes. ELASTOSTART™ HANDLE: has a built-in shock absorber for smoother starting. INTELLICARB™ COMPENSATING CARBURETOR: measures air on clean side of air filter and adjusts metering diaphragm in carburetor. Keeps RPM level even when filter begins to clog. INTERCHANGEABLE GEARBOXES: fit many models, allowing for one machine to do a variety of tasks. EASY2START™ SYSTEM (E): This starting system reduces the strength and effort needed to start the engine. AUTOCUT® TRIMMING HEAD: is a proven and dependable TapAction™ cutting head. Other cutting attachments available on most models. STIHL trimmers, brushcutters and lawn edgers have many common features. However, all models may not have all the features shown here.